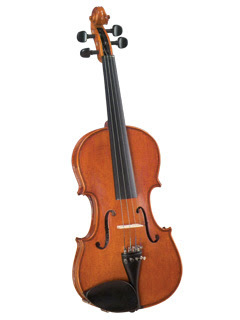 "Cremona SV200 violin outfit, a fine violin for the intermediate violinist. Includes guaranteed trade in plan. This is for the intermediate player, it features ebony pegs, tailpiece and chinrest. This violin outfit features the legendary quality of the Cremona violin family. Trouble free tuning with a deluxe tailpiece with built in fine tuners. What a boon for students and teachers. Hand carved sound chambers offer the most pleasing tone."